ParkVia offers alternative options for those looking for Bilbao Airport Parking at low cost and close to the airport. We have found alternatives to the official car parks at Bilbao airport so that we can offer our customers cheaper options when looking for Bilbao Airport Parking, without compromising on security or peace of mind. The process is simple; we list the operators available at Bilbao so that customers can book from the comfort of their own home. You can find all the necessary information about each car park and the services they offer by clicking on the car park name. Booking your Bilbao Airport Parking is very easy: just enter the dates and times you wish to use the car park and you will see an instant quote giving the TOTAL cost of the booking. Once you have completed your booking print off the email confirmation and drive to the car park who will then be happy to transfer you, free of charge, to Bilbao Airport terminal. There is no fee for booking on line but a deposit is required to guarantee a parking space. ParkVia brings you the best options for low cost Bilbao Airport Parking. 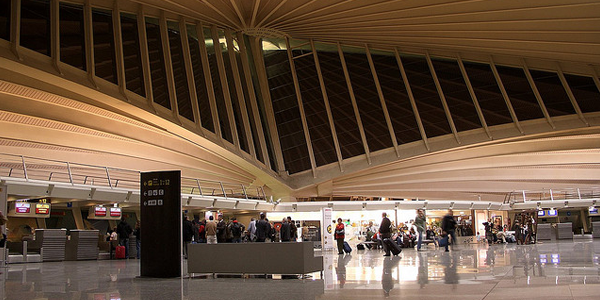 Bilbao International Airport is located 12 Kilometres from the city centre of Bilbao, in the municipality of Loiu. It is the biggest airport and the most important of the Basque Country and northern Spain in terms of passenger numbers, 3.800.000, which passed through the airport in 2013. Bilbao International Airport is linked by motorway with the journey taking 15 minutes. Furthermore, the airport has unrivaled connections with northern Spain's biggest cities: the A-8 motorway goes to Santander (108 km) heading west and with San Sebastián (119 km), Bayona (160 km) and Pau (265 km) heading east. The A-68 motorway connects the airport to Vitoria-Gasteiz (66 km), Logroño (152 km), Burgos (158 km) or Pamplona (159 km).